Having executive presence means being able to speak clearly, with authority, to anyone, including those you want to influence, whether your superior or your constituency. Much of this comes from experience. You feel more comfortable each time you are in a situation that challenges you to speak with authority to an authority figure. You feel stronger each time you get a good response from an audience. But can you create a voice that sounds like a leader? 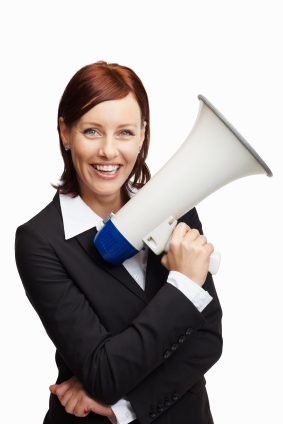 What is a leadership voice? Three characteristics of leadership are strength, confidence, and clarity. Your voice reflects how you feel and think. It is the voice of the mind. If you feel strong, confident and clear, you have more ability to sound that way. But there are certain things you can do to cultivate these characteristics in your voice. In an article called “Executive Presence,” communication experts, Jan and Neal Larsen Palmer, talk about the way leaders act and speak. They suggest a physical presence that says “leadership” and recommends that you “Command and expand the space around you.” To do this, practice sitting or standing “tall,” with your chest lifted and abdomen free to breathe deeply. When standing, keep yourself grounded on both feet, but with your weight slightly forward on the balls of your feet. When seated, sit on the edge of your chair with both feet on the ground as if you are ready to get up out of the chair. Let your arms be open rather than clinging to your body. Stress keywords. Speak loudly and with energy, but avoid yelling. Let your passion show up in your sound by incorporating your breath into your voice. Here’s how: Take your breath in deeply. 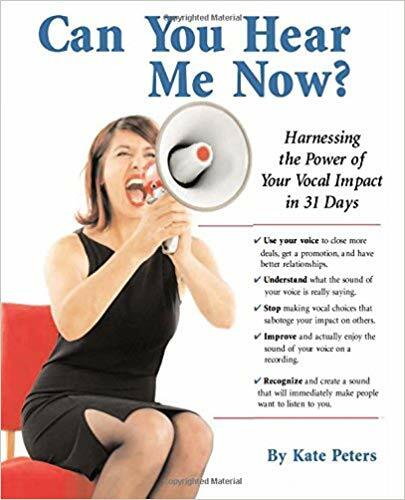 As you speak, “excite” the sound by using more air in your voice. The sound you are looking for is not a breathy voice, but, rather, an energetic sound. Make statements. Mix up your inflection so that you sound inquisitive and open, but end completed ideas with a downward cadence. Avoid using filler words like “and,” “so,” or “but” to begin sentences. Avoid hedging with “I guess,” “I believe,”” kind of” or “sort of. “ Smile and use humor. Tell personal stories. Be transparent and authentic. Use expression to color your words. Pitch your voice using mask resonance to amplify it and create an appealing tone. Vary the intensity, duration, and volume to keep listeners engaged. Use pauses to allow others to fully digest your content. Keep your pace at 140-150 words per minute. Contrast ideas with new color at the beginning of a new idea, and when comparing statements or concepts. Make a commitment. Get a commitment. Ask for the close. Give a good close. Give a call to action. Look them in the eye. Be present. In the King and I, Anna sings a song with her children about whistling a happy tune, pretending to be confident when she feels afraid. The last line is “ Make believe you’re brave and the trick will take you far. You may be as brave as you make believe you are.” I say, sound like a leader, feel like a leader, be a leader. What do you think?